Eliezer Ben-Yehuda (1858- December 16, 1922) is known as the father of modern Hebrew. He was one of the earliest supporters of Zionism, and it due primarily to his initiative that Hebrew was revived as a modern spoken language. Ben-Yehuda was born in Luzki, Lithuania, in 1858 as Eliezer Perelman. His father, a 'Habad orthodox Jew, died when he was 5. At age 13 his uncle sent him to a Yeshiva in Polotsk. The head of the Yeshiva was a secret follower of the Haskala (enlightenment) movement and turned Ben Yehuda into a free thinker.His uncle tried to save him from heresy by sending him to study in Glubokoye. There, Ben-Yehuda met Samuel Naftaili Herz Jonas, and was taught Russian by his eldest daughter, Deborah, who later became his wife. His Russian studies enabled Ben-Yehuda to enter the gymnasia (high school) which he graduated in 1877. He soon became a convinced Zionist. The Russo-Turkish War of 1877-1878 and the struggle of Balkan nations for liberation inspired Ben-Yehuda to form the idea of revival of the Jewish people in its ancestral soil. He held that the Jews, like all other peoples, had a historic land and language. He wrote in the preface to his dictionary: "it was as if the heavens had suddenly opened, and a clear incandescent light flashed before my eyes, and a mighty inner voice sounded in my ears: the renascence of Israel on its ancestral soil.... the more the nationalist concept grew in me, the more I realized what a common language is to a nation..." He decided to settle in the land of Israel and in 1878 went to study medicine in Paris so as to have a means of support. Ben-Yehuda's plan for a national home did not interest Hebrew writers for the most part. His first essay, "The burning question" (She'elat Hasha'ah) was published by the Hebrew periodical, "The Dawn," (Hasha'har) in 1879, edited by Peretz Smolenskin, after it was rejected by others. It called for emigration to the land of Israel and creation of a national spiritual center of the Jews there. 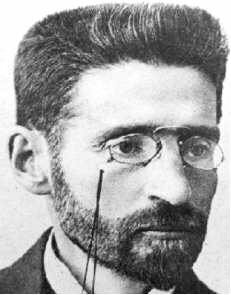 Thus, Ben Yehuda was also the real father of Cultural Zionism, later popularized by Achad Haam. In Paris, Ben Yehuda contracted tuberculosis. He discontinued his medical studies and decided that the climate of Jerusalem would be better for his illness. While in Paris, he learned from travelers that Hebrew was not a dead language among Asian Jews. He also enrolled in the teachers' seminary of the Alliance Israelite Universelle where he was to be trained as an instructor in the Miqveh Yisrael agricultural school. He attended lectures of Joseph Halevy, who had been an early advocate of coining new Hebrew words. Ben Yehuda moved to Jerusalem in 1881, with his new wife, Deborah Jonas. Eliezer and Deborah established the first Hebrew-speaking home in Eretz Yisrael, and their son, Ben-Zion (who became known by his pen-name, Itamar Ben-Avi) was the first child in modern times to be nurtured with Hebrew as his native language. He attempted to disguise himself as an orthodox Jew in order to maintain contact with them and learn Hebrew and propagate it. However, the latter soon rejected him, and Ben-Yehuda became actively anti-religious. Soon after his arrival in Jerusalem, Ben-Yehuda became a teacher at the Alliance School, on condition that his courses would be taught in Hebrew. Thus, this became the first school where some courses were taught in Hebrew. Ben-Yehuda wrote for "Ha'havatzelet" (The Lily), a Hebrew literary periodical, and launched "Hatzvi" -- The Deer -- a weekly newspaper. "Hatzvi" was the first Hebrew paper to report on news and issues in Turkish Palestine. This was a considerable achievement, given the limitations of Hebrew, the Turkish censorship and draconic financial limitations. Ben Yehuda had to coin new Hebrew nouns and verbs for modern concepts. Debora Ben-Yehuda, his first wife, died of tuberculosis in 1891. Her younger sister soon offered to marry Ben-Yehuda and care for his two small children. An emancipated woman of great drive and conviction, she made it her life's work to support Eliezer and his enterprise. She took the Hebrew name Hemdah, quickly learned Hebrew, became a reporter for his paper, and later became its editor, allowing her husband to focus on his research of the lost Hebrew words that the reborn tongue required and coinage of new ones. Orthodox fanatics were angered the exposes in Hatzvi of corruption in the distribution of Halukah -- their charily dole. They deliberately mistranslated a line in a Hanukkah story in Hatzvi, "Let us gather strength and go forward" to mean: "Let us gather an army and proceed against the East." They informed the Ottoman government that Ben-Yehuda was calling on his followers to revolt. He was arrested, charged with conspiracy to revolt and sentenced to a year's imprisonment. Jews throughout the world were outraged; his sentence was appealed and he was eventually released. In 1904, Ben-Yehuda together with Yellin, Mazie and others, founded and presided over "Va'ad HaLashon", the forerunner of the Hebrew Language Academy which he later advocated in 1920. He worked 18 hours a day on his "Complete Dictionary of Ancient and Modern Hebrew." In 1910 he published the first of six volumes to appear before his death in 1922. After his death his widow Hemdah and son Ehud continued publishing his manuscript until all 17 volumes had been published by 1959. The dictionary lists all the words used in Hebrew literature from the time of Abraham to modern times, scrupulously avoiding Aramaic words and other foreign influences that had entered biblical and mishnaic Hebrew. Ben Yehuda was forced to leave Palestine during World War I, when the Turks deported "enemy nationals." Along with other Zionist leaders he spent the war in the United States, returning to Palestine in 1919. >Zionism - Definition and Brief History - A balanced article that covers the definitions and history of Zionism as well as opposition to Zionism and criticisms by Arabs, Jewish anti-Zionists. Zionisme/A> - israelinformatie- Zionisme Israel/JodendomIsraelisch-Palestijns Conflict Anti-Semitisme Shoa - a Dutch Web site with many useful Jewish, Zionism and Israel links (in English too).